The genesis of this story starts in France, where I lived for four years as a child. My father was a career officer in the Army, and we lived in Orleans, in the Loire Valley outside of Paris. Besides his career, my father also pursued his love of food, a trait that I inherited as well. I was born with a strong culinary memory, and much of my life has been spent searching for and learning to recreate the tastes I remember from childhood. Raising these two pigs seemed a natural step in that journey. The pigs were brothers, one destined to become a November pig, and the other a January pig. Both were barrows and the offspring of Sophie, a beautiful red 750 pound Tamworth sweetie owned by Max and Mitra Luick of Aloha Rainbow Farm in Western Maine. About 30 to 40 pounds each and as red as mama, they arrived at Oak Hill View Farm in Brooks in dog crates in the back of a pickup and were rooting within minutes of being released behind portable fencing set up in one half of a large garden. They were instant rototillers! The old adage “You are what you eat.”, applies to what our food eats as well. All of our food, both animals and crops, were grass fed and naturally fertilized until the 40s’ or so and arrival of the corn era and manufactured fertilizers. Local and closed system was the rule. I wanted to raise these pigs on a diet as rounded and varied as my own. Their diet included a custom mix of barley and oats (no corn and definitely no soy) fed as a supplement, grass and day-lilies, volunteer vegetables from their half of the garden, piles of vegetable scrap from the kitchen and the local co-op, and gallons of whey and clabbered, raw Jersey milk. As summer turned to fall, they gobbled down acorns and apples with gusto and the rate at which they grew was proof of the logic. Summer turned to fall and in early November the larger pig left Oak Hill for a professional appointment, hitching a ride with Walt Whitcomb’s pigs (Walt owns a dairy and his Jerseys’ were the source of all that wonderful clabbered milk). He dressed out at 182 pounds, which probably put his live weight somewhere around 240 to 250 pounds, and returned as chops, roasts, ribs, and ground pork, frozen to be incrementally made into a wide variety of sausages later. One ham, the hocks, and one side of bacon were all cured free of nitrates and smoked. The other ham became jambon blanc or jambon de Paris as it is also called. The other belly was portioned into thirds to later become flat pancetta, or belly for braising or grilling. The fresh liver became mazzafegati dolce and mazzafegati saporito, two Umbrian sausages that trace back to Italy’s Renaissance period. Walt had generously given me the jowls, trotters, ears, and tails from his two pigs, so when added to the same parts from the November pig, I had a stockpile of marvelous bits to work with. In Roman cookery “Il quinto quarto” refers to “the fifth quarter,” all the tasty things left behind after the roasts and chops all went home with those who could afford the choice cuts. Jowls, ears, tails, trotters, skin, as well as organs all qualify. The first choice was simple, with 6 jowls on hand, I should make guanciale. Guancia is Italian for jowl, and so guanciale is the Italian word for an air-cured jowl. Sea salt, sugar, Tellicherry peppercorns (more correctly called Thalassery peppercorns) if you can find them, torn fresh bay leaves, fresh or dried sage, fresh rosemary, thyme, and crushed juniper berries are used to make a dry rub. The next step is Air-curing the jowls for several weeks. The result is an oval of meat surrounded by delicious fat, easily worth the usual $15 to $20 a pound. Some ears, tails and trotters all made their way to the Full Cold Moon supper at Salt Water Farm in Lincolnville and became tofeja, one of many pork-centric courses for the event. Matched with, beans, cotechino, cotenna, and ribs, tofeja is the Italian Renaissance equivalent of French cassoulet. Instead of a three day process involving refined charcuterie, confit, ribs, and beans, tofeja is a much more simple but equally delicious dish of beans, ribs, and extremities. The flavor is the very essence of pork itself, concentrated with a rich mouth-feel made creamy due to an over the top gelatin content. The original thought was that as the November pig went off to the abattoir, and his smaller brother would star in a 3 day public class. This would begin with a home slaughter, on to butchering, and conclude on the last day with French and Italian culinary things being done with him in the kitchen. The logistics just never worked out, and so he stayed. The November pig had been a macho pig, bullying his smaller brother in his efforts to grab all the food, which made the smaller pig was shy and skittish. When his brother left, the smaller pig began a quick transformation. He calmed down, ate his fill, and began to grow like a weed. He became friendlier, almost gregarious, touching noses with dogs, and expecting to be patted and scratched before getting serious about breakfast or dinner. He thrived with his brother gone. While this pig grew and his personality bloomed, I changed as well. He was gentle and easy to like. I discovered ticklish spots that he enjoyed having rubbed, and sometimes he would stop chewing to savor my touch. We were growing a little too close, and he was becoming a much bigger pig. December came and an appointment was considered but dates at local abattoirs were now at least one to two months out. Thus, this summer pig was fated to become a January pig. As my fondness for him increased, so did a sense of concern and responsibility. I liked him too much to leave his fate in the hands of a stranger, I wanted to be there, and I also wanted to honor him by using everything from nose to tail, including blood and casing, something a licensed abattoir would never permit. The notion of a class had originally stemmed from a desire to share and give others a chance to better understand the connection between land and table. It was now much too cold to organize and promote another attempt at a class, and handling a large pig solo, is almost impossible. Fortune smiled when a friend, Shawn Clements, told me that he knew someone with experience willing to help. Shawn cuts his own deer, and Michael Kelley is a farmer who raises and slaughters his own pigs. It was still early December when we set a date for January 9. Saturday came and we met early in the morning. The day was clear and windy with temperature in the teens. The plan was to shoot the January pig in his winter pen, bleed him, and then transport him to Michael’s where we had a more sheltered place to work. It was a good humane kill with one shot to the head, quickly followed by a good stick, neatly cutting both arteries. The bleed went well, and I raced the pot of blood off to the house before we headed to Michael’s farm. Once there, we laid the January pig in a well scrubbed bed-liner and started heating water for scalding and scraping. It was almost unbearably cold and the 50-gallon drum of water was taking forever to heat. We finally reached what should have been a good scalding temperature and realized instantly just how cold it was, potfuls of hot water wouldn’t budge the red hair. Back to heating a watched pot. After reaching a water temperature of 170°F to 175°F in the boiler, the scald began to work and scraping continued. We were forced to duck into Michael’s kitchen a couple of times to warm up while more water heated, and it was dark before we finished scraping. The cold was numbing by this time and we gratefully took a break to eat an absolutely marvelous dinner that Michael’s wife Karen had prepared. Warmed, satisfied, and bundled up again, we trudged back in the cold, to finish our work. It was close to 9 O’clock before we finished transforming the January pig into shoulders, hams, and sides and placed them in the cooler to prevent their freezing. Over the next two days, chops were cut along with ribs, bellies, and shoulders. Everything was saved, and precious little would go to waste. I still felt the pang of connection to this pig, and was determined to consume him entirely as an act of appreciation. Trotters, ears, tail, head, organs, and casing were kept, no less valuable than his chops. There are many pictures of the event but it feels difficult to share them. They were taken to study and improve my skills as a butcher, and somehow feel private. Instead, this story now becomes a chronicle of all the wonderful things that would come from this dear animal, and I wanted to focus on charcuterie as a way of celebration. Still having potatoes from the fall harvest, and a daily supply of fresh eggs no more than 20 feet from the door, the first project would be boudin noir, or blood sausage. Pure local cream from a grass fed herd, fresh breadcrumbs, and the blood I caught were made into footlong boudins. Right behind the boudin came lard rendered from the leaf fat. There were still many jars of lard from the November pig, so the thought occurred that leaf lard would be set aside and used exclusively as it is in Italian kitchens. Strutto, Italian for lard, is sometimes flavored with herbs or garlic, perhaps a little salt and pepper, and then used as a paste to rub into chops before grilling or pan searing. As mentioned earlier, the January pig blossomed when his brother left. Cooler weather and no more competition spurred his appetite, and so he grew. His trimmed hams were just under 30-pounds each. Another pig from the same litter, raised for a chef I know, dressed out at 318-pounds with hams of similar size. We had no scale but following simple math, the January pig should have weighed somewhere between 350 to 400-pounds. There are arguments for smaller pigs but I don’t agree with them. A smaller pig can’t compare. I have a treasure of thick fat back for lardo and other uses. At a ratio of about 25% fat to meat, the was 30-pounds of fresh ground pork to use for fresh. I chose 3 types, a spicy Portuguese linguica because it is so good with fresh eggs, and salsiccia fresca to use with pork, beef and tomato passata from the garden for making ragú, and a garlicky variation of saucisse de Toulouse called Le Petit Cru à l’Ail to be used in cassoulet. 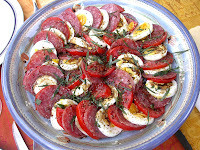 As a child in France, one my most vivid memories of food was a dish called Salad de Saucisse Sec, a fanned tomato stuffed with hard boiled egg and saucisson sec, a French dry-cured sausage. One ham and both shoulders would become saucisson sec, and soppressata. “Più vicino all'osso, più dolce la carne,” is an Italian saying that translates to mean “The closer to the bone, the sweeter the meat,” and so the ears, tail, and the trotters have been frozen and are waiting to become another tofeja or something equally exciting. Sometime soon, skin from the January pig will be combined with ground pork from the November pig to make cotechino, and the brothers will be reunited. All the skin has been saved, from the fatback frozen with the rind and from the ham and shoulders used for salami. Some of it to be used uncooked, stuffed with garlic and herbs, and then rolled and tied as it is used in tofeja, and some will be air-dried and used in Fagioli con Maiale e Pane Cotto, another rustic Italian bean dish. The only major project left is to make coppa di testa, or head cheese. The January pig’s head was huge and had been split into two haves, even so, coppa won’t be possible until a very large pot has been found. For years, most of the food I eat has had a very short chain of custody. Vegetables from the garden or local markets, meat no more than 3 or 4 people away from the pasture are the norm. In Maine it is easily possible to eat a predominantly local and seasonal diet. Invoking the “Marco Polo” exemption for things like olive oil, coffee, pepper, and wine make it possible to explore true cuisine. The amount of thought and effort that went into raising these two pigs has been well worth the time. The greatest responsibility wasn’t feeding, watering, and caring for them but rather picking through my memories and books to find recipes that would allow me to include myself in the circle of sun, soil, plants, and animals. Soon, Sophie will be bred again, and I’ve already had conversation about piglets with Mitra. Perhaps I’ll become excessively fond of one or both, just as I became with the January pig but also perhaps, I will make prosciutto to express my gratitude and respect.